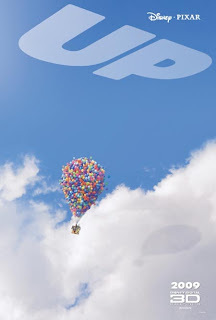 The movie "Up" touches our hearts. It prompts us to reflect on life's unfinished business and our tendencies to put even the biggest dreams on hold while we go through life's ups and downs. In a silent, flashback montage and less than 5 mins, we went through the decades that Carl and Ellie spent together, this is the first touching moment, can't help shedding some tears. When Ellie passed away, she leaves behind a scrapbook as well as a very grumpy widower, who retreats into himself. After an unfortunate incident, Carl was about to be evicted from his home and then, he got a plan. 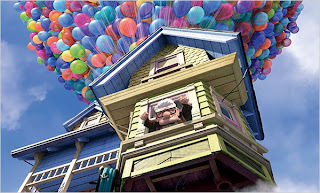 Using thousands of colored balloons tied to the house, prying it from its foundation and carrying it up skyward, Carl intends to fly it to South America, fulfilling Ellie's dream of going to Paradise Falls, somewhere in South America. 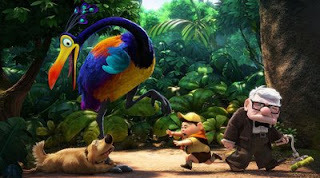 Here comes the funny parts - Russell (a chubby Junior Wilderness Explorer), Kevin (a brillantly coloured rare bird) and Dug (the talking dog), laugh so much here. Russell recalling time spent with his dad - "Sometimes the boring stuff is what I remember most." Ellie's adventure book - Carl was her adventure, not really going to South America. Carl pinning the Ellie's badge on for Russell - "for a boy who showed true courage, going above and beyond his duties." Poignant, emotional, endearing, enlightening, thought-provoking, and enjoyable - go, watch it. Hey Homely, watch as many movies as you can now. Cos when yr baby is born... most of your time will be used up on loving yr precious child!! Yeah, less movie time for you and wifey... but it'll be all worth it! Especially when ur kid hugs u like a kitten.